At last...Sandvox 2.0 has arrived! After many months of intense work and debate, we are pleased and exhausted to unveil Sandvox 2.0. This version represents a huge leap forward in Sandvox's development. It makes website creation easier and faster, and gives Sandvox users more flexibility than ever before. Our customers' input has been invaluable: As Sandvox has evolved, our users haven't been shy about telling us what works, what doesn't, what other tools they'd like to have, and how we could make their website creation simpler yet more sophisticated. 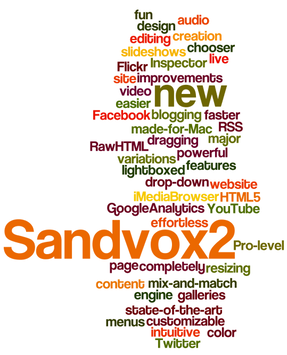 Saying that Sandvox 2.0 features "more than five dozen new features and major improvements" is true, but also something of an understatement. What's under the hood is just as important—if not more—than the changes you'll see in the user interface. Thanks largely to Mike Abdullah's efforts, Sandvox 2.0 introduces a completely new architecture and editing engine. What this means in real terms is that Sandvox users can now mix and match content "objects" in more ways than ever. Want to include text, photography, and video on the same page? No problem. And that's just for starters. We're rolling out more than 20 of these flexible objects, including Facebook and Twitter, and more are in the works, from us as well as third-party developers! The latest version of the Karelia iMedia Browser is built into Sandvox 2.0, so finding all that content to mix and match will be that much easier. Rest assured we didn't forget the fun, so Sandvox 2.0 also features a completely new design chooser and new color variations for popular designs. Want even more customization options? A redesigned Inspector really opens up the power of Sandvox, letting you selectively apply and adjust features and modify objects in a very intuitive way. Sandvox 2.0 sites now automatically support HTML5 and jQuery. Comment support has been expanded to include Disqus, IntenseDebate, and Facebook Comments, making conversation on your Sandvox blogs easier and more robust. Our launch of Sandvox 2.0 also heralds the end of separate Regular and Pro editions. We've decided that Sandvox can help everyone become a Pro—or at least create a website like one—so every copy of Sandvox is now fully featured. So what's all this going to cost? As small business owners, we know the importance of keeping an eye on the bottom line and not letting expenses run amok. With that in mind, and since Day 1, we've provided free updates to licensed users. Sandvox 2.0, however, is far more than an update. It's a major upgrade, and it represents more than two years of work. Accordingly, if you are moving up from a previous version of Sandvox, we are charging an upgrade fee. For a limited time, Sandvox 2.0 will be priced at US$67 (regularly US$77), and upgrades are introductory priced at US$37 (regularly US$47), through May 20, 2011. If you recently purchased Sandvox, don't fret: Anyone who purchased Sandvox after January 5, 2011 is eligible to receive a free upgrade. We'll notify you automatically by email. New licenses and upgrades are all available directly from us by visiting the Karelia Store. Welcome to the new world of Sandvox 2: we hope you love it just as much as we do!